The Matador was new to the British army as a gun tractor, carrying chassis number 08531041. It was in service with the army until being demobbed in 1947. 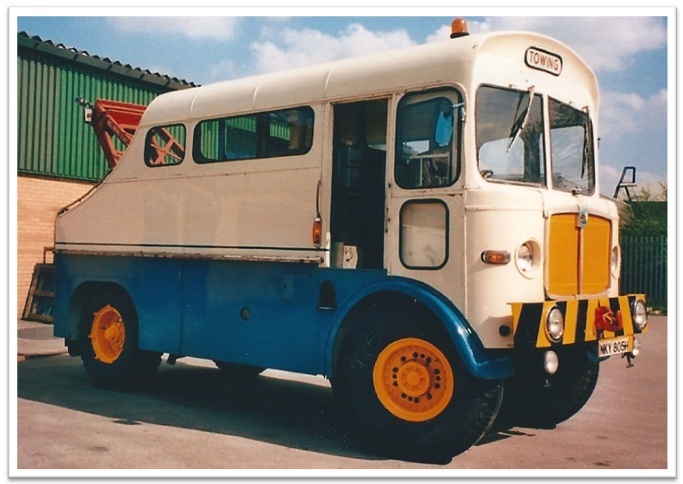 Following this, Bradford City Transport purchased the Matador that same year, for use as a towing/recovery vehicle for both trolley buses and motor buses. When purchased, it had some of the original gun tractor body removed, and a chariot type body fitted which contained a small workshop area for roadside repairs. Also fitted was a five ton Harvey Frost crane, and a snow plough bracket/attachment at the front, for related duties. Allocated fleet number 081 in the ancillary vehicle numbering system, the Matador was painted all over in Bradford blue and operated from Ludlam Street depot on trade plates 065AK and occasionally 164KU. In 1953 the vehicle was renumbered 018, and during the 1960’s it was repainted all over in yellow. Come January 1970, the Matador was registered for the first time, the number allocated was NKY805H, although now registered, it continued to operate on trade plates. By the end of the decade, the Matador was showing signs of old age and deterioration, particularly with its timber framed body and cab. The decision was then made by management at BCT to give the Matador a complete overhaul and new appearance. Mechanically, much work was undertaken. The original AEC 7.7 litre engine and gearbox were removed, replaced by the bigger AEC AV590 9.6 litre engine and Thornycroft D166WX gearbox, as fitted to AEC Regent mk V’s, of which BCT had a large fleet of. Externally, the body and cab was completely removed and replaced with a coach built body, incorporating many bus parts. These include an Alexander Fleetline/Atlantean front roof dome, AEC Regent mk V grille and front corner panels, East Lancashire trolley bus cab doors, along with many other bus related parts such as lights and lamps. A small workshop area was included in the design and the Harvey Frost crane was refitted. This work was carried out of late 1972 and early 1973 at Thornbury Works. After this work was completed, the Matador was repainted in the revised BCT livery of blue and cream, with yellow wheels and yellow front grill. It was then placed back into service, carrying a new fleet number of 025. In April 1974, the Matador, along with the rest of the Bradford fleet was passed to the newly formed West Yorkshire PTE (Metrobus/Metro was the fleet name used). It was quickly painted out of Bradford colours in to all over cream/white with Metro Bradford fleet names fitted to either side. Later on, it was repainted into the standard WYPTE livery of Verona green and Jonquil cream. The Metro fleet names and WYPTE logos were also fitted, but the fleet number of 025 was still used. With the deregulation of bus services on October 26th 1986, the Matador passed to Yorkshire Rider, where it continued to be used as a towing/recovery vehicle, but by now operating from the Bradford Interchange bus garage. The Matador was again fully repainted, this time in to full Yorkshire Rider livery, and allocated a new fleet number of 9360. The Matador soldiered on until the early 90’s, when it was eventually replaced by a more modern Daf 3300 wrecker. The Matador then languished, parked up in the Interchange garage, until the opening of the unsuccessful Transperiance Bus Museum in Bradford, to where it was donated. Upon the closure of Transperience, the Matador was sold in auction to private ownership for ongoing preservation, but was very rarely seen. It then passed through a variety of owners, including Stoneywood Recovery of Halifax, who carried out extensive repairs on the gearbox, clutch, chassis and some welding work. In early November 2008, the Matador was sold for ongoing preservation and further restoration to Neil Millington and Kiran Tolson. In 2012, Kiran Tolson became the sole owner.